Phil Ryan designed the 18 hole course which opened in April 2007. Black Mountain Golf Course overlooks the wonderful Black Mountain range and has natural creeks that run throughout the course, it joins 4 other prestigious golf course's in Hua Hin - which is fast becoming a golfing paradise and is only a 45 minute drive from Icandi Hideaway which makes it the perfect club to go and play at. The Club House has a work out room where the keen golfer can warm up their muscles before playing a round of golf, it is fitted with a swing net and variety of other exercise equipement. Golfers can enjoy having their own personal caddie's for the duration of the round of golf who will drive the buggy around for you. 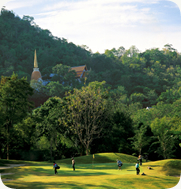 Black Mountain Golf Course is set in an atmosphere of tranquility and has a beautiful fine dining restaruant that gives panoramic views of the whole course. 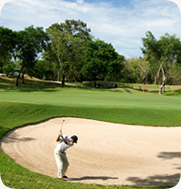 The house manager at Icandi Hideaway can arrange transport to Black Mountain Golf Course and can also arrange anything else that is required.